Season the steaks evenly with ½ teaspoon salt and ¼ teaspoon pepper. Allow the steaks to stand at room temperature for 15 to 30 minutes before grilling. Prepare the grill for direct cooking over medium-high heat (400° to 500°F). In a small bowl whisk the buttermilk, yogurt, chives, lemon juice, ¼ teaspoon salt, and â…› teaspoon pepper. Stir in the blue cheese. Set aside. Brush the tomatoes and onion with the oil and season evenly with salt and pepper. Grill the tomatoes and onion over direct medium-high heat, with the lid closed, until the tomatoes are blistered (don’t worry if the tomato skins slip off) and the onion is tender, turning occasionally. The tomatoes will take 6 to 8 minutes and the onion will take 8 to 10 minutes. Cut the onion slices in half. Grill the steaks over direct medium-high heat, with the lid closed, until cooked to your desired doneness, about 8 minutes for medium rare, turning once or twice. Remove from the grill and let rest for 3 to 5 minutes. Cut the steaks into thin slices. 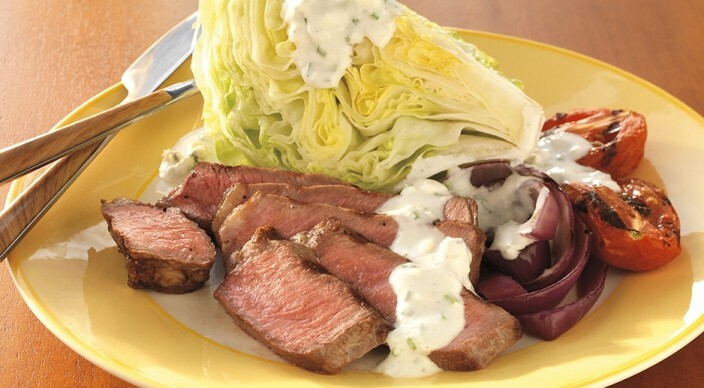 Place an iceberg lettuce quarter on each of four serving plates, and then top with an equal amount of the steak, tomatoes, onion, and dressing. Serve immediately.